Feeling smart without being protected is one thing you may not be comfortable with especially if you are a kind of human who likes secrecy and privacy. As an android phone user it is sure that you have tons of apps, photos, videos and contacts on your smart phone, some of which you will prefer to keep away from the public. But keeping these away from the “public” may sometimes be difficult, hence installing an app to protect your smart phone may be your sure bet. Ever had a request from a friend asking you to hand him/her your smart phone? Most probably YES. So supposing you have some private files or apps you don’t want anyone else to see, what would you do? Yes you could monitor them personally but sometimes your friends or an intruder may want to get access to your apps or files without your knowledge. In such case installing a good app protector may be your savior. For the purpose of this post we have compiled list of five android apps we consider as best for securing or locking your android smart phone. It is worthy of mention here that the apps listed in this post does not in any way substitute your antivirus app. This is because while your antivirus app protects your smartphone against malware, the apps here only prevents unwarranted access on your smartphone by friends or intruders. Even though there are lots of apps on the Google play store that helps you secure apps and private data(s), these five apps have proven to stand out from the others. We have used most of the apps here and can confirm they really works. Feel free to drop anyone we’ve missed to the list via the comment section. Talk about most popular android app for securing your smartphone against unwanted access and AppLock should come first in the list. This is because aside being the first to hit the internet, AppLock comes with loads of security features. You can easily lock any apps, images, videos, locations and so on. The only down-side of the applock tool is the loads of ads that comes with the free version. The obvious limitation can however be removed by upgrading to the premium version of the app. CM security AppLock tool does not only secure your Android phone and apps but does so with a feature that lets you know who is it that’s trying to mess with your privacy. It captures the picture of the intruder, stores a copy on your phone and automatically send a copy to the email address you used while setting up the app. We have used the app extensively, and featured it in our list of must-have apps for SmartPhones. The CM security can comfortably compete with any of the top app lockers for android phone and devices. First, Smart App Protector features what is known as “Observer Mode.” With this feature, the app monitors several failed attempts to unlock and access an app and will then capture the face of the intruder using the selfie camera on the smart phone. Other features include multiple unlocking methods (pass-code, pattern lock and gestures), remote control and customization themes. By “remote control” we mean you could unlock your phone from a distance by sending an SMS to it. This feature however proved buggy during our testing. Smart App Protector is available for free but if you hate seeing annoying ads then you will have to pay $2.75 for the premium version. Perfect App Protector is available for free on the Google Play Store but the FREE tag shouldn’t put you in doubt as the app also comes with some unique features to protect your smartphone from intruders. One feature on the Perfect App Protector which makes it unique is the Stealth mode feature. In this mode an App become complete invisible from launcher. 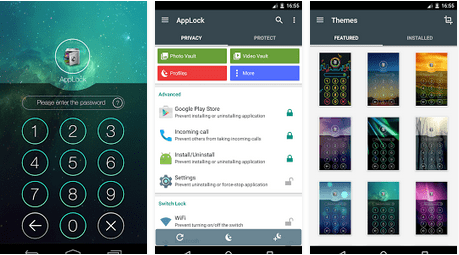 Perfect App Protector allows you to lock any App with Pattern, Pin or gesture. The name of this app explains exactly what it does. It can password protect almost any app on your phone including Gallery, SMS, Contacts, Gmail, Dialer and so on. It works flawlessly on phones, tablet devices and PDA(s). The interface is non-intrusive and quite easy to set up. I would like to recommend a great app to you. Hope you like it. It’s LEO Privacy~ It can lock all the apps in your phone and Bluetooth, WiFi, settings and so on. What’s more, it has multiple unlock ways to protect your phone, such as password, pattern, cover and custom unlock theme background.